Rabies is a viral disease, that affects the brain and central nervous system, and can be spread to mammals (including people and animals- both wild and domestic) through contact with saliva or nerve tissues from an infected animal.The most common way the rabies virus is transmitted is through a bite or scratch from a rabid animal. Rabies can also be spread when infected saliva or nerve tissue comes in contact with an open wound or is introduced into a mucous membrane like the eyes, nose or mouth.In most cases, once symptoms appear, rabies virus is almost always fatal. Providing your pet with a rabies vaccination is the easiest way to keep your pets safe. The following are a list of rabies vaccine clinics in Ontario. No current listings at this time. For more information on rabies vaccination clinics in this area please visit the Durham Region's website. For more information on rabies vaccination clinics in this area please click here. For more information on rabies vaccination clinics in this area please visit the Haliburton-Kawartha Pine Ridge Health Unit's website. For more information about rabies vaccination clinics in this area please visit the Hastings Prince Edward Public Health website. There will be three rabies vaccine clinics held in April and May. For more details on dates and locations please visit the Huron County Health Unit website. There are several rabies vaccination clinics being held across Lambton County in April and May. For more information on locations, dates and time please visit the Lambton Public Health Unit website. Rabies vaccination clinics are being held throughout the North Bay Parry Sound District between now and August. Please visit the North Bay Parry Sound Public Health website for their rabies vaccination clinic schedule. To learn more about rabies please visit the OAVT RRP online Rabies Public Portal. Rabies vaccinations help to keep both animals and people safe from rabies. In Ontario, rabies vaccination clinics are accredited by the College of Veterinarians of Ontario and supervised by licensed veterinarians. Rabies isn't the only thing to worry about! Although rabies vaccination is an important part of your animal's health care, disease prevention and treatment does not stop at rabies. 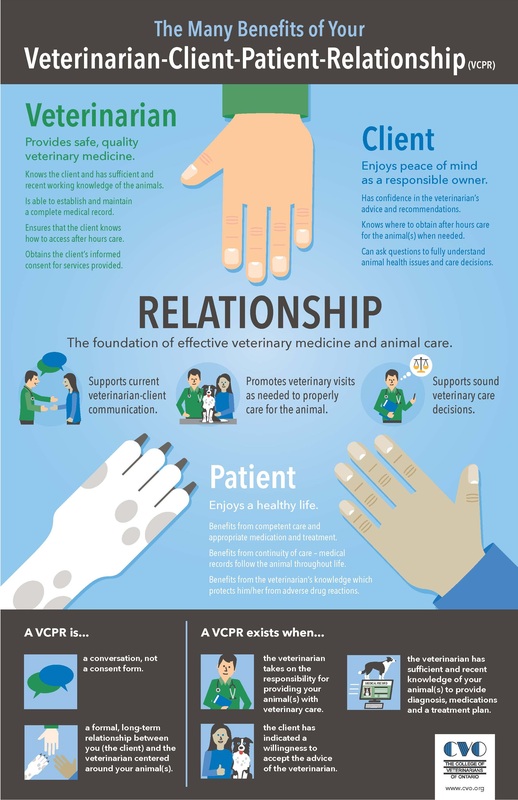 It is important to build a relationship with a Veterinarian and their veterinary healthcare team to ensure all of your pets medical needs are taken care of. This may include: health examinations, preventive vaccinations and treatments against other diseases that are integral to the well being of your pet. Building this relationship will enhance the quality of life your pet receives. For more information on how to keep your pet healthy click here.